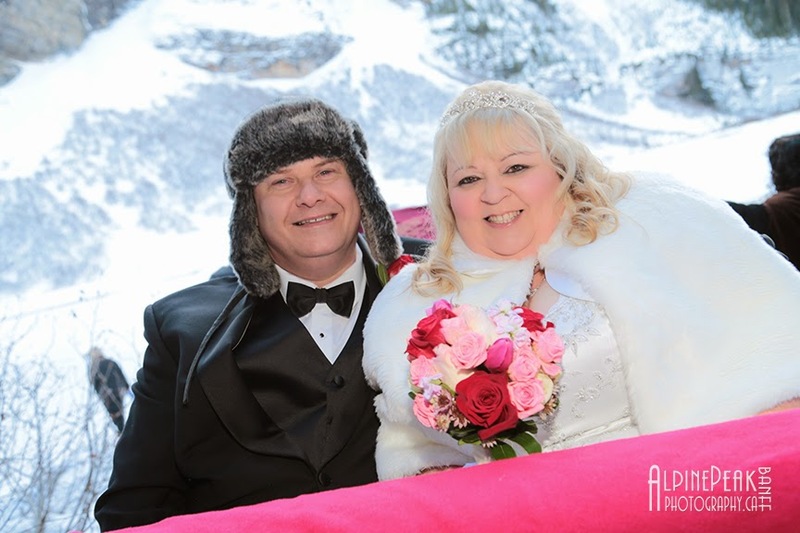 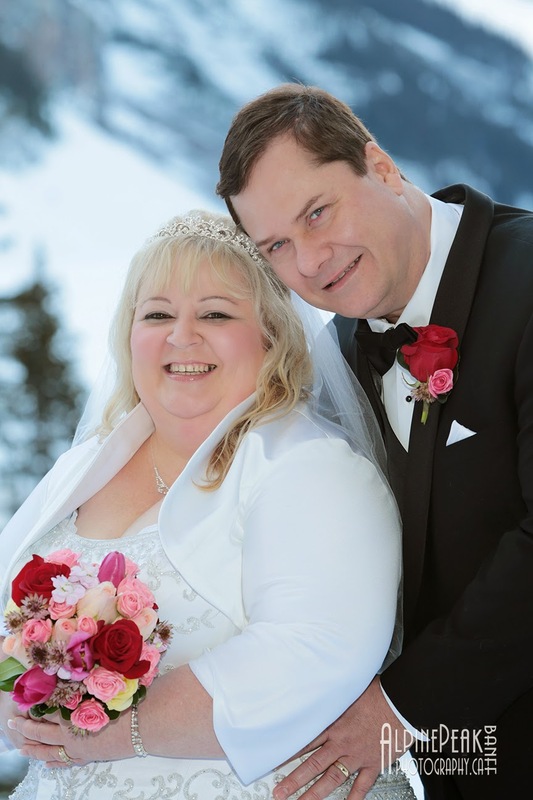 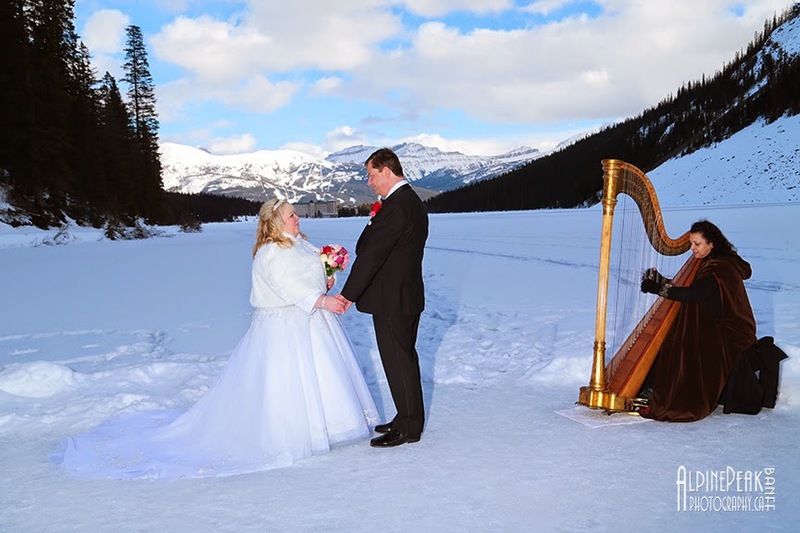 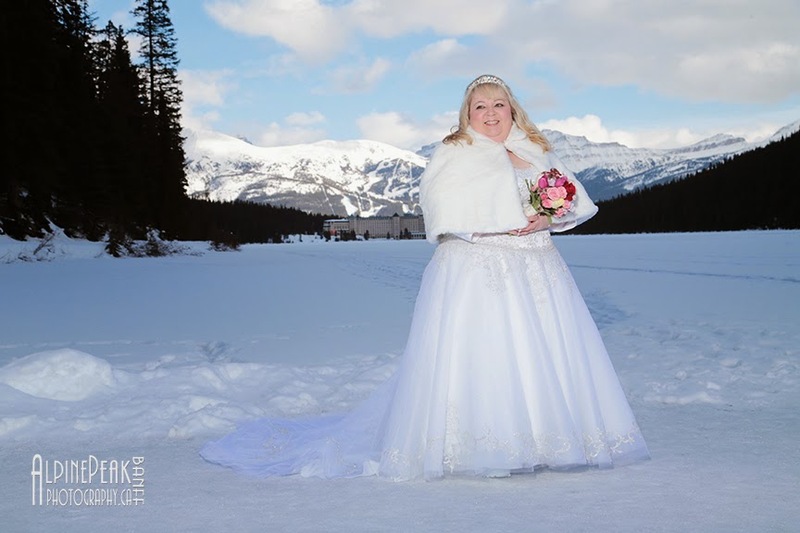 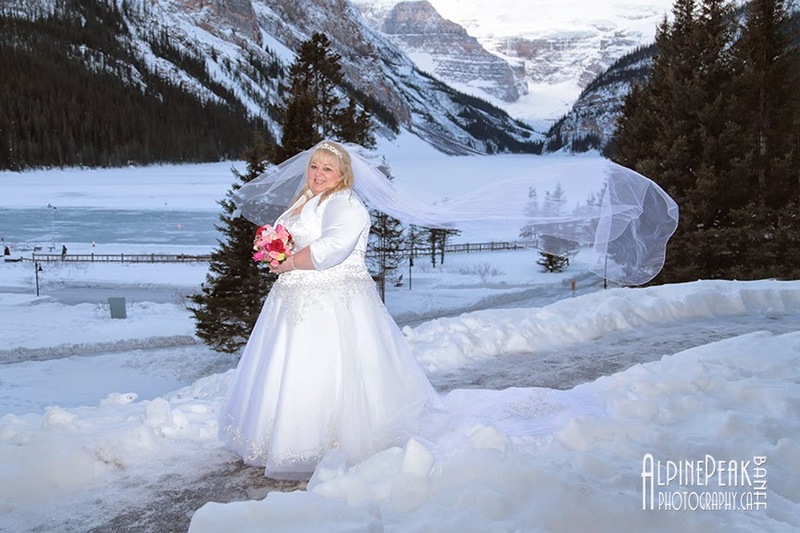 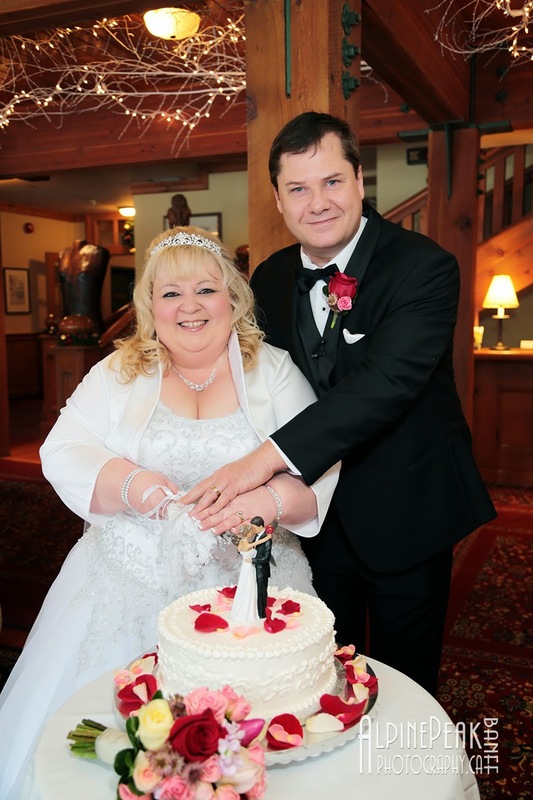 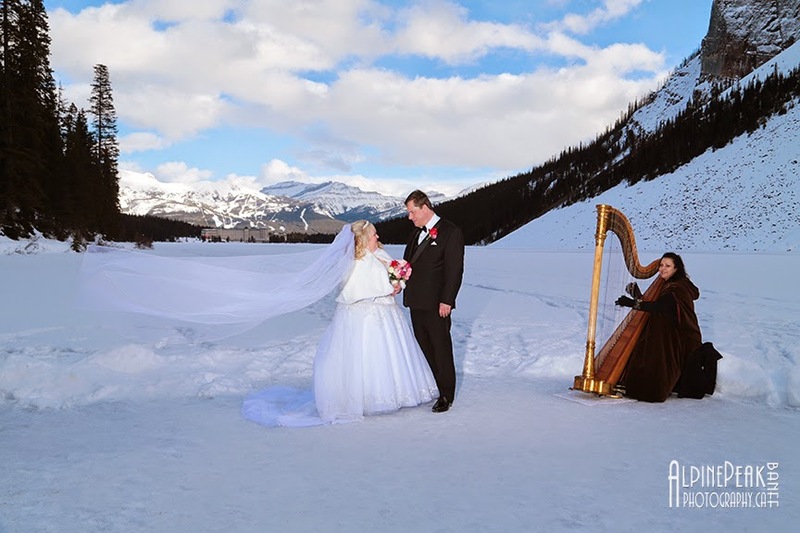 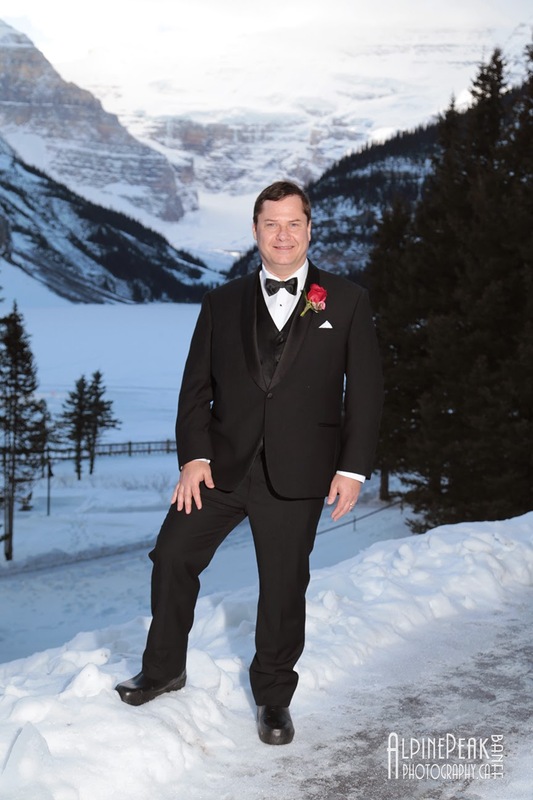 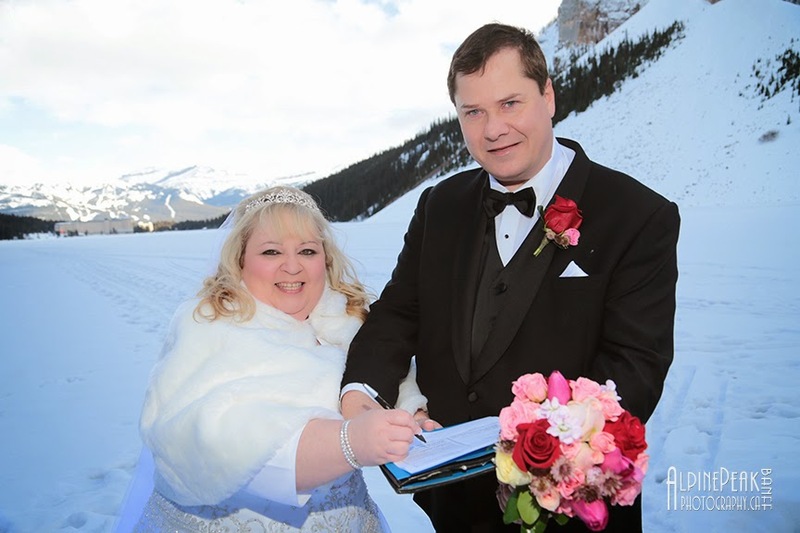 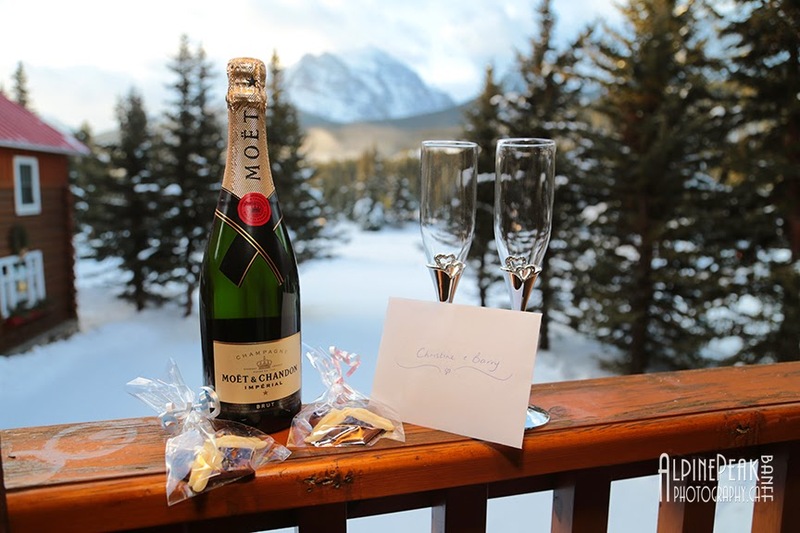 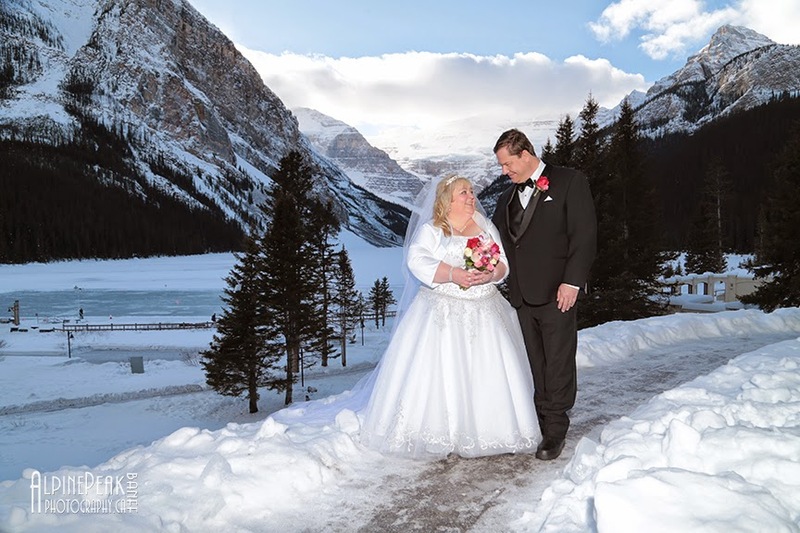 Elopement Wedding at Lake Louise. 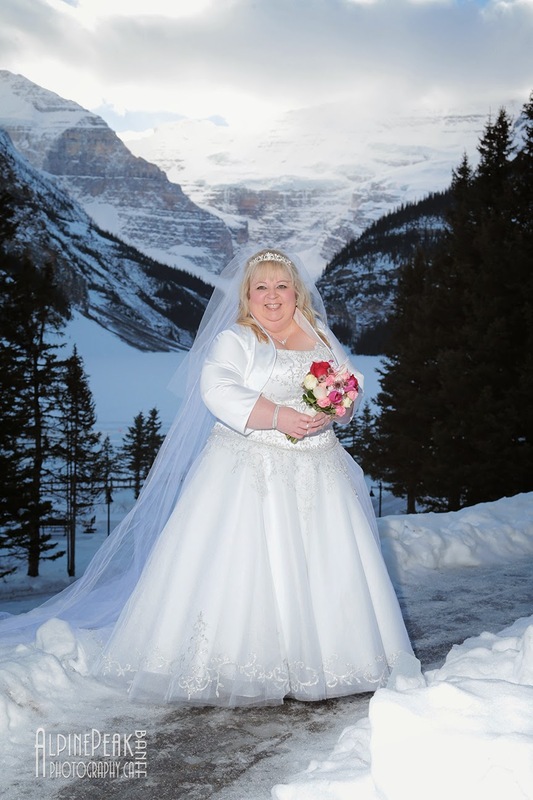 with the Chateau Lake Louise in the background. 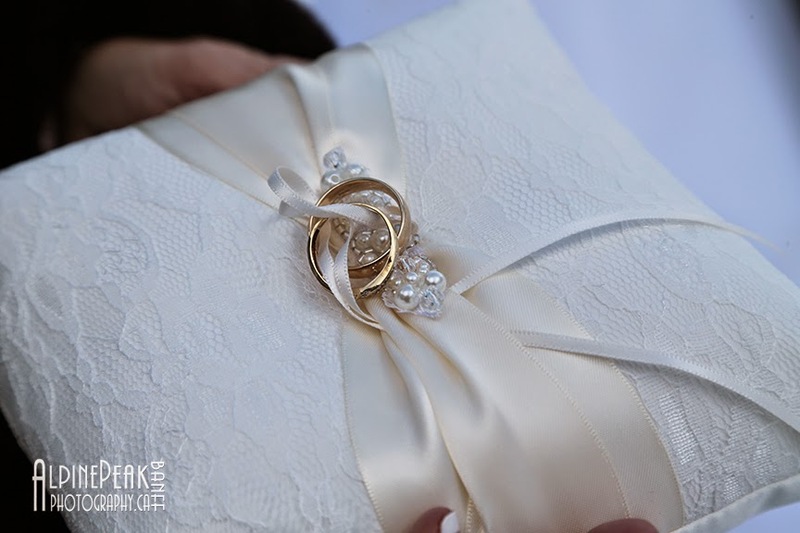 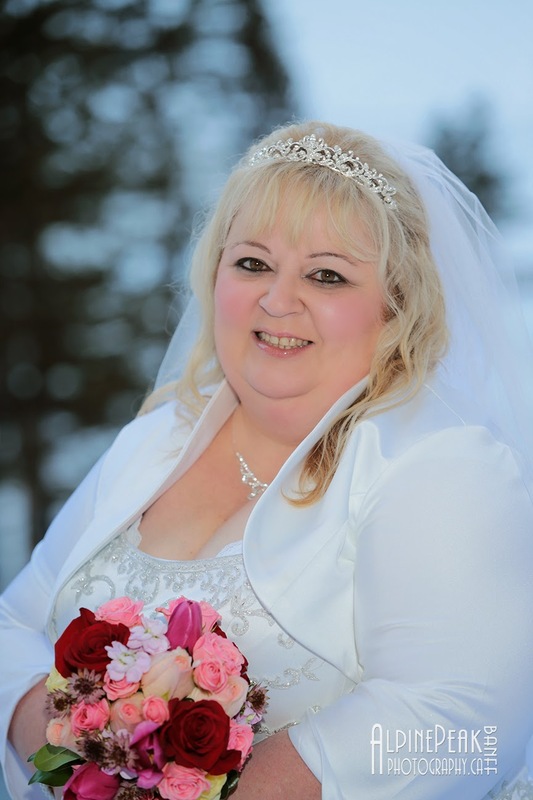 Love this photograph of Christine and her beautiful veil - Stunning! 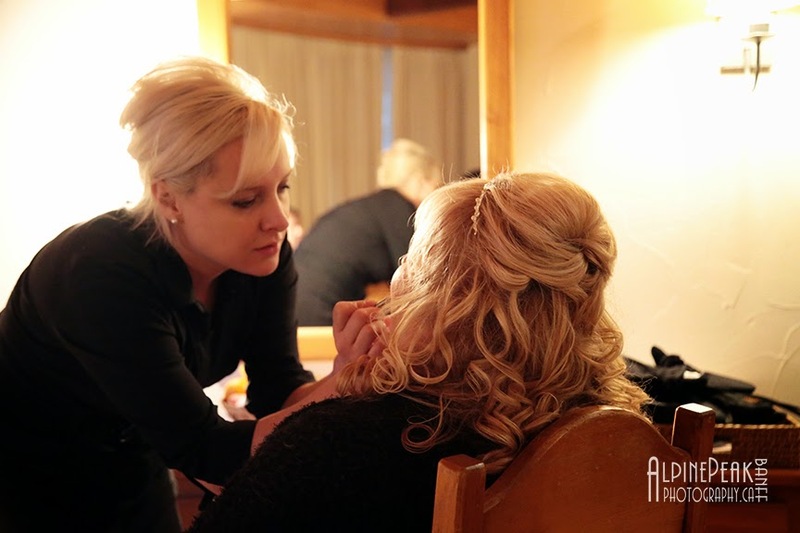 Suzanne was preparing Christine's hair and make up. 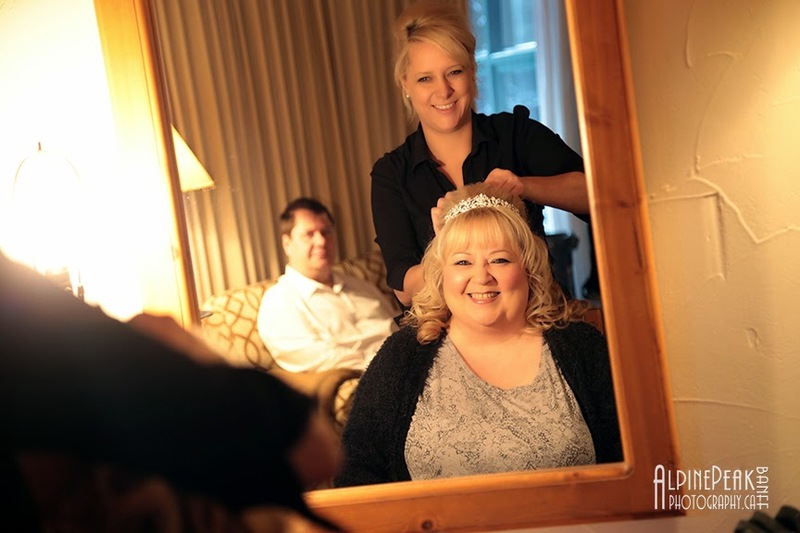 Barry was relaxed as he watched his beautiful bride get ready for their special day. 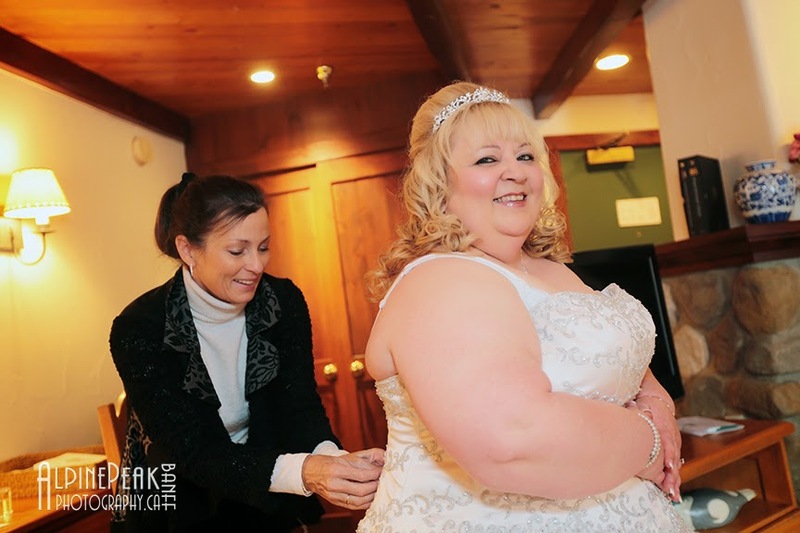 The ladies were having fun. 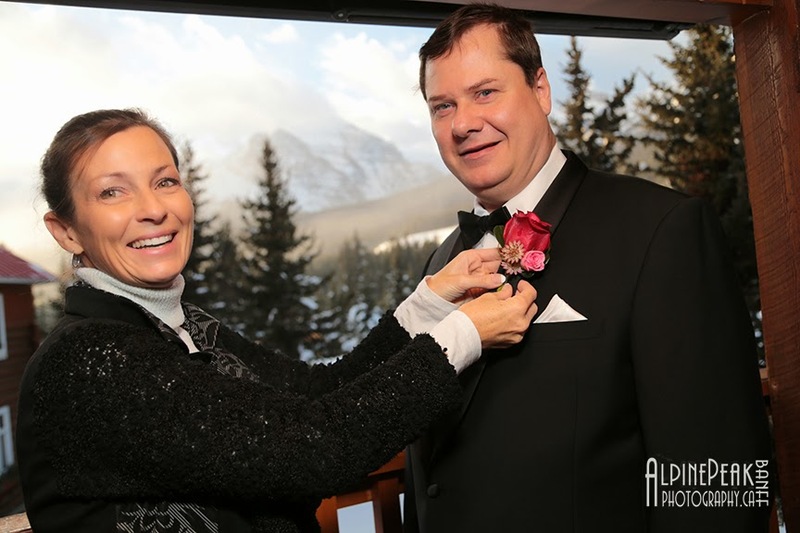 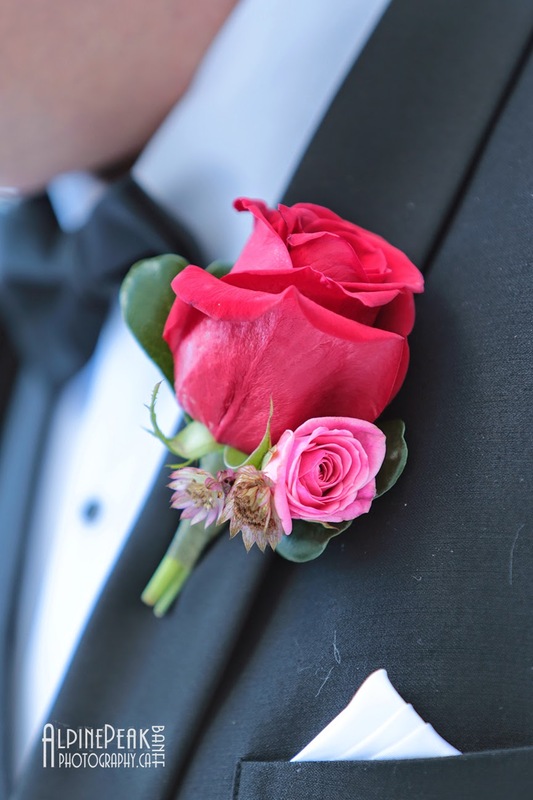 Barry's turn to get ready and Sharon (the wedding planner) pinned in his boutonniere. 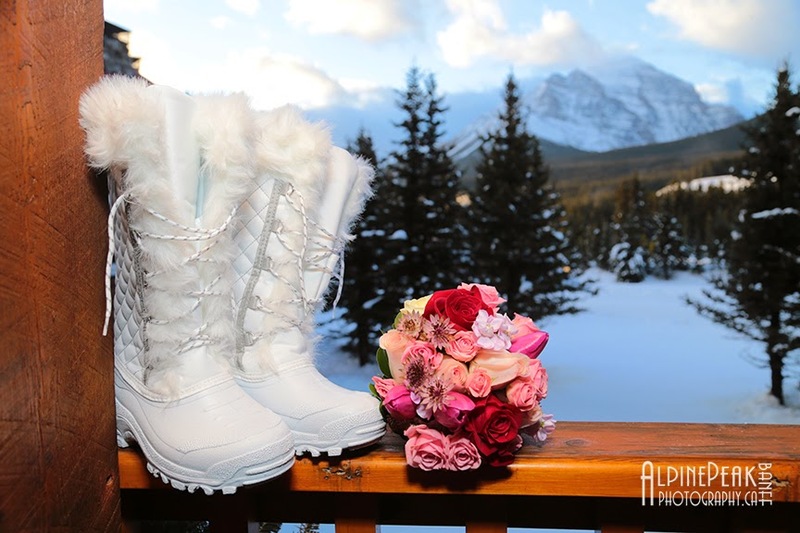 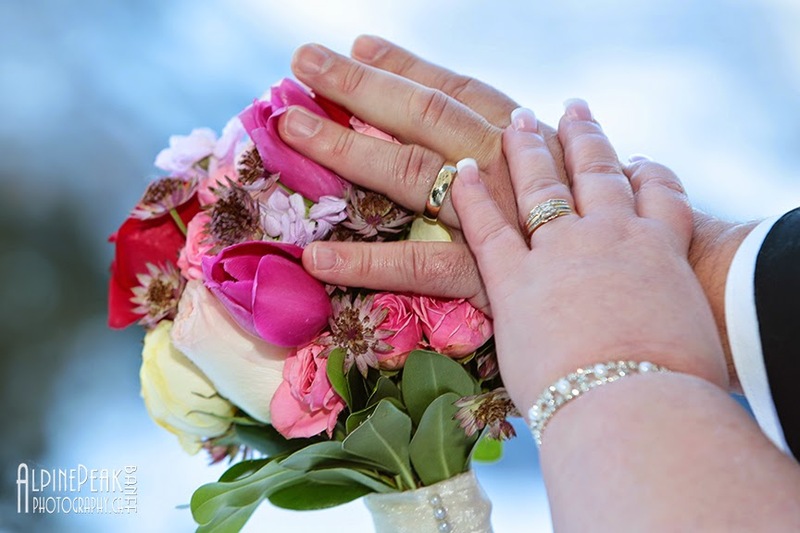 Christine's fresh flower bouquet was hand tied by Forget-Me-Not Flowers in Banff. 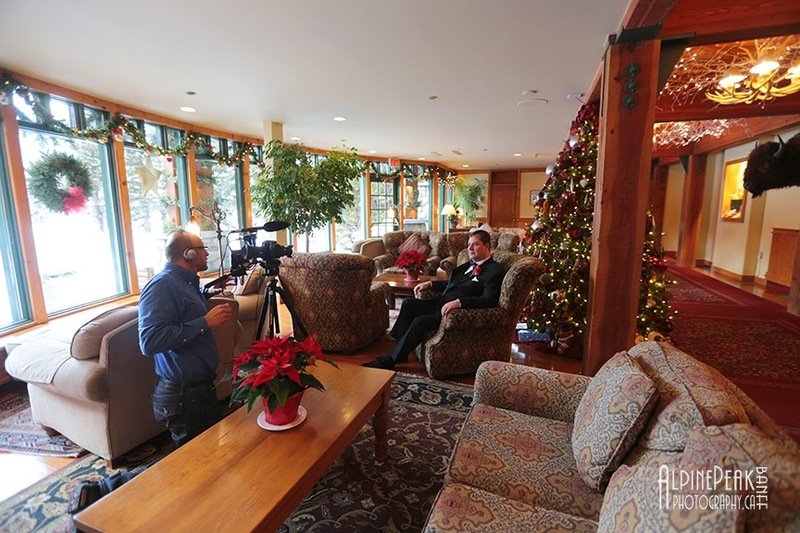 In the lobby of the Post Hotel, Alex interviewed Barry for their wedding video. 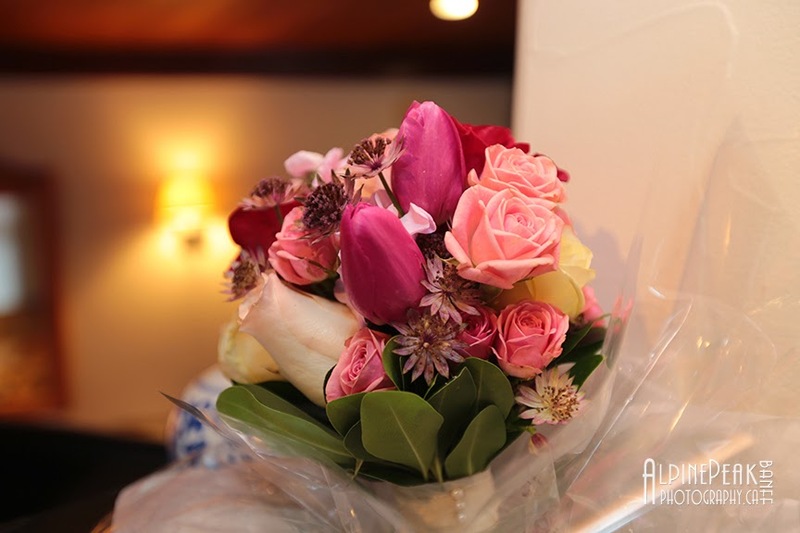 to be enjoyed in their room later with a glass of champagne. 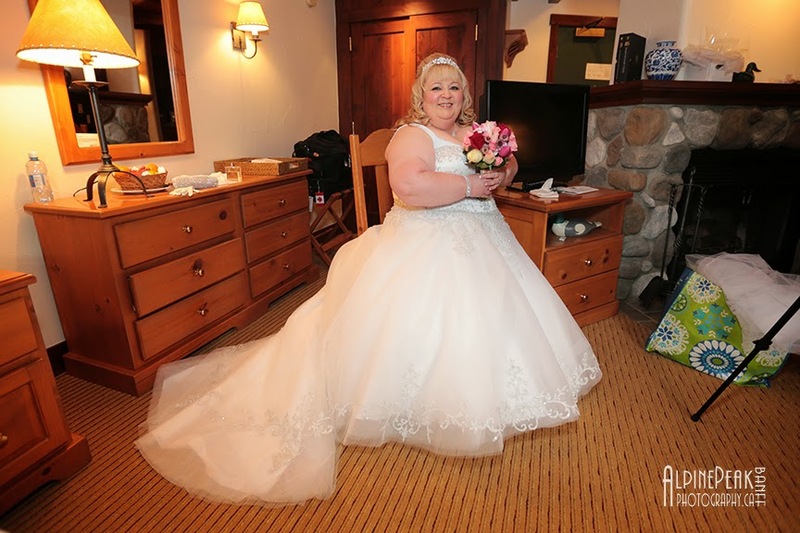 and Sharon assisted by lacing it up. 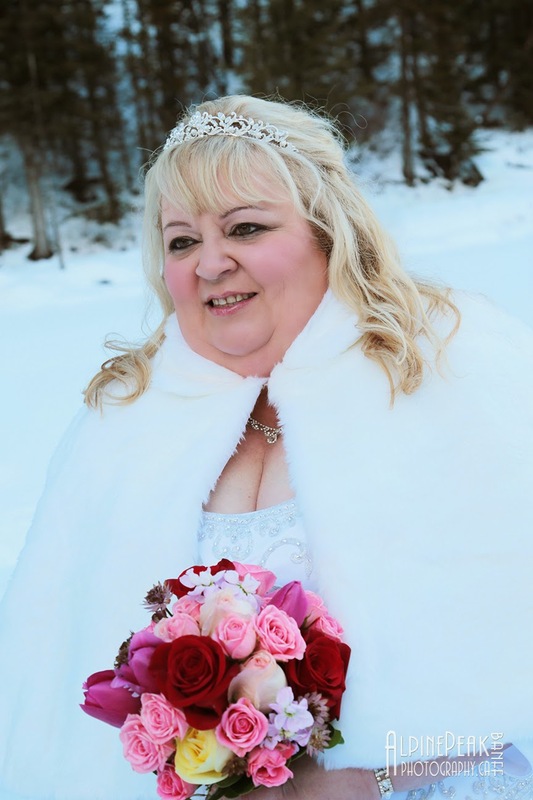 She was perfect like a princess. 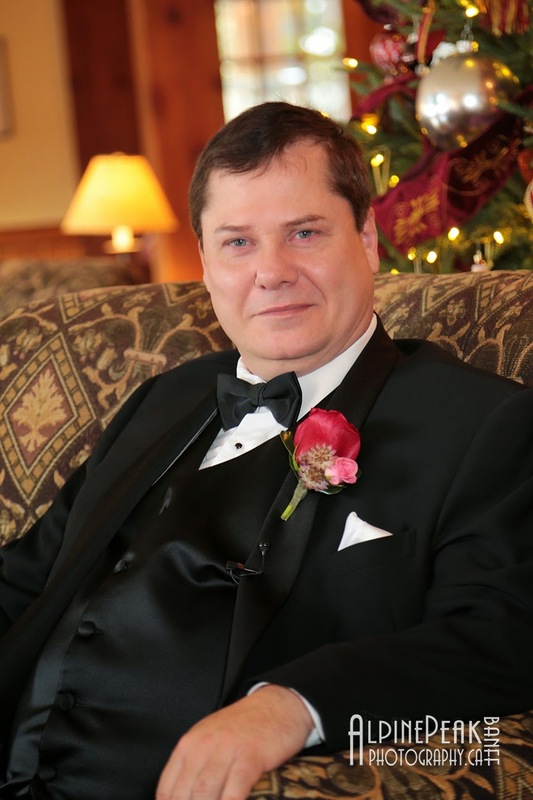 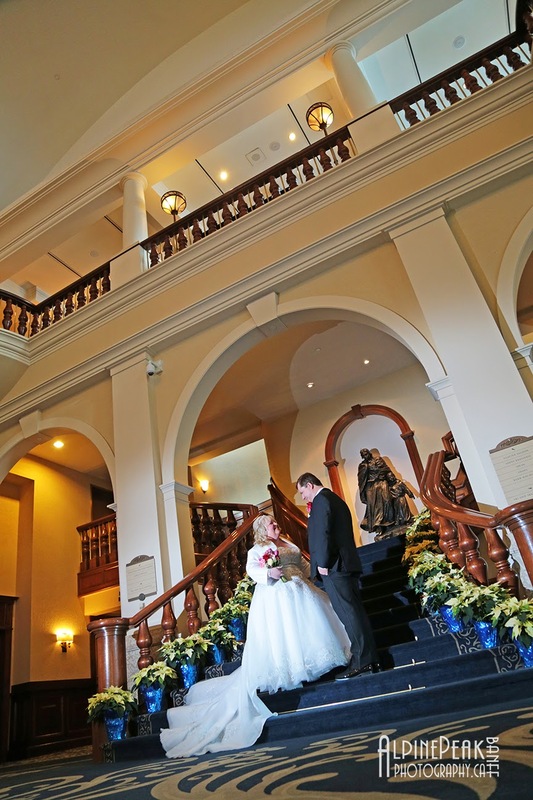 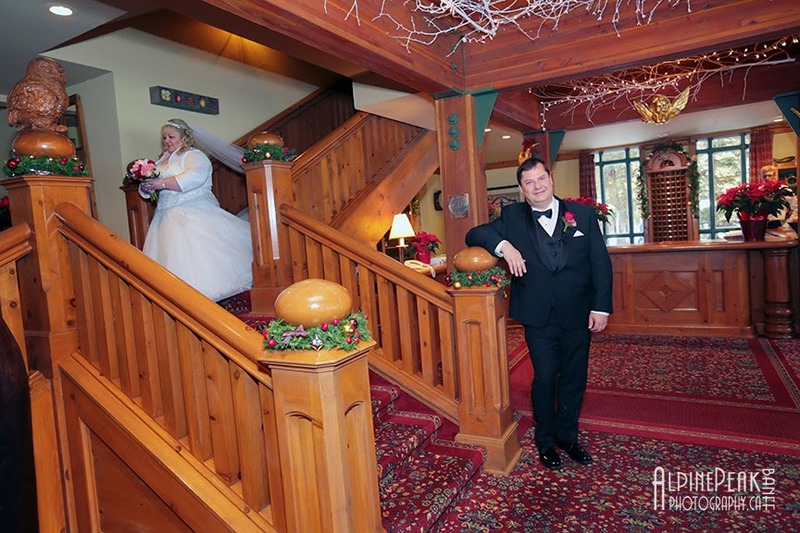 Barry patiently waited in the comfortable lobby for his gorgeous bride to arrive. 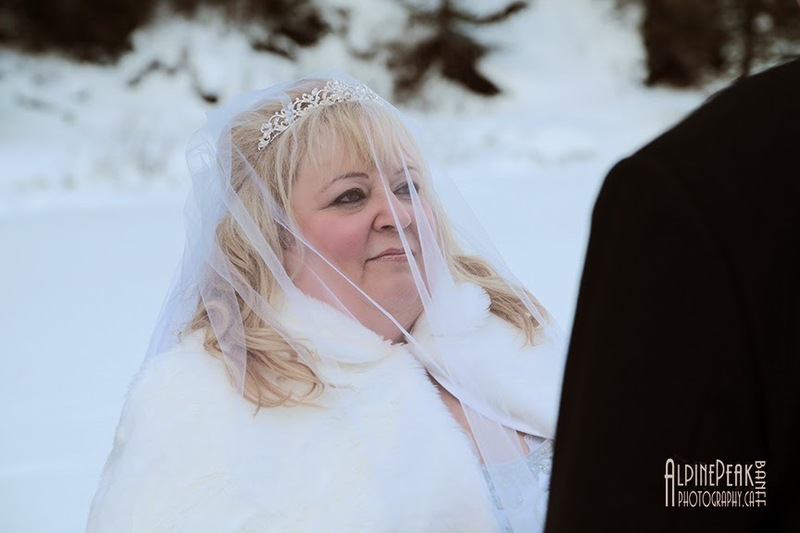 It is a very special moment when a groom sees his bride for the first time. 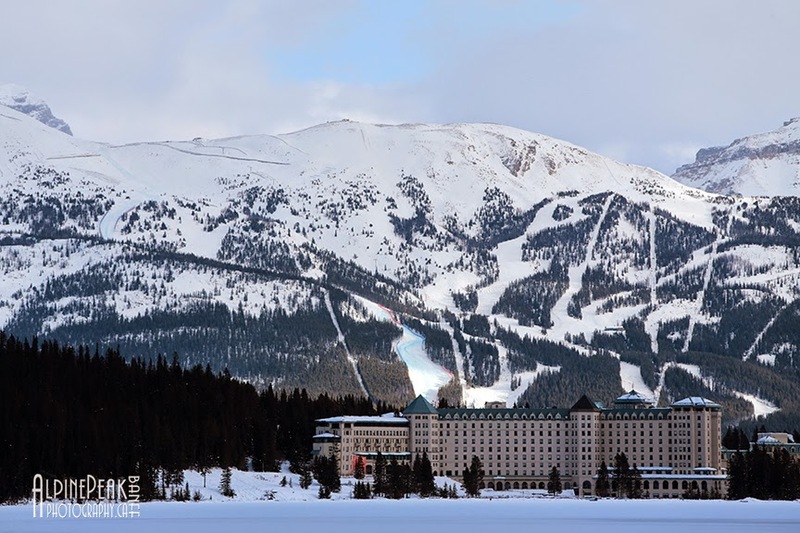 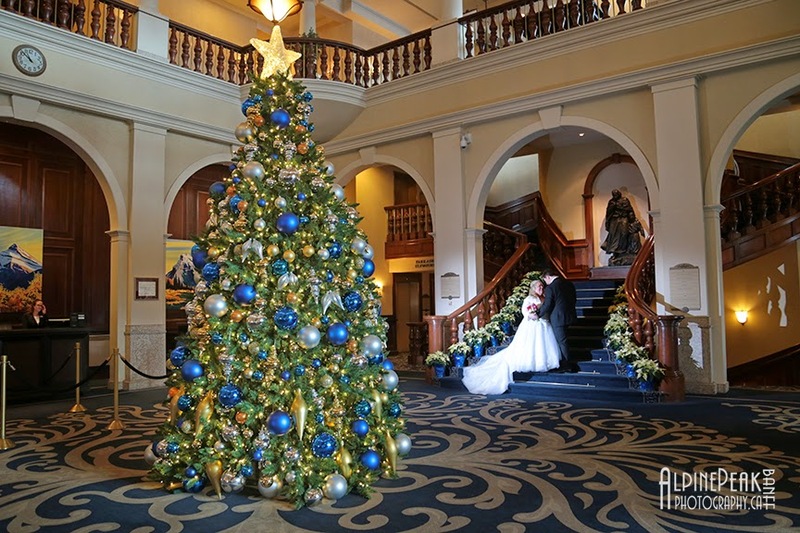 The Fairmont Chateau Lake Louise was beautifully decorated for the Christmas season. 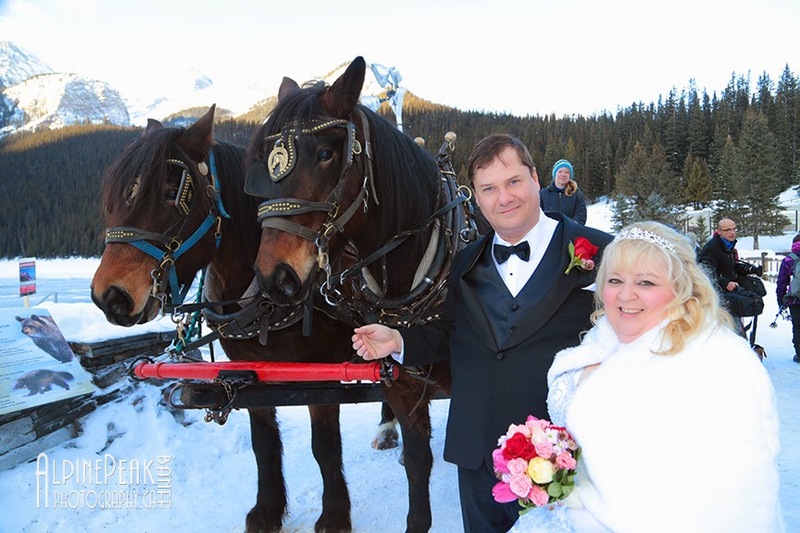 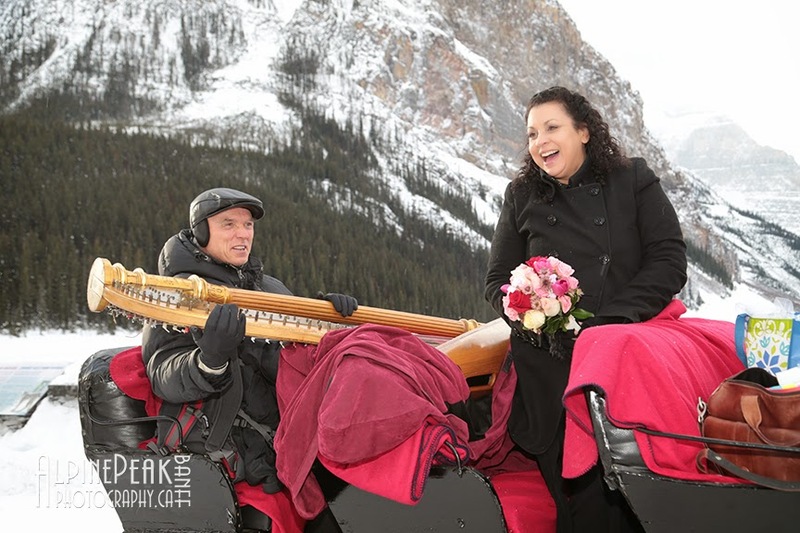 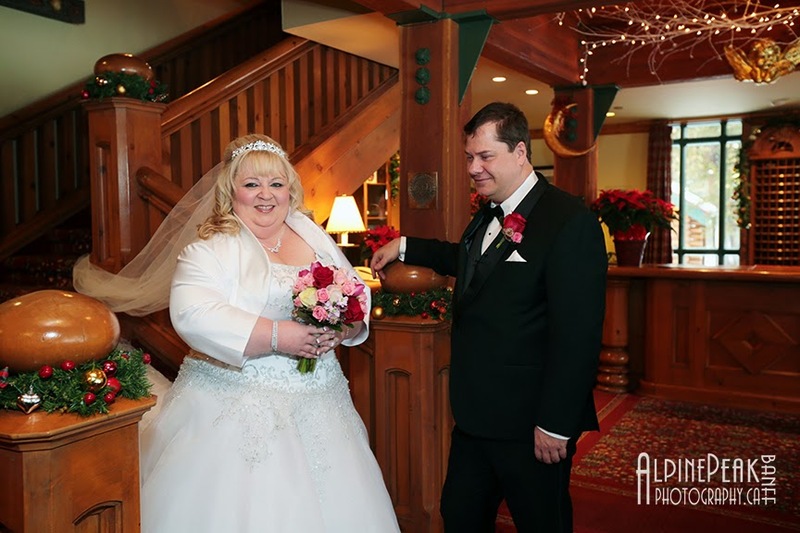 Christine & Barry made their way out to the sleigh and meet the rest of the wedding team. 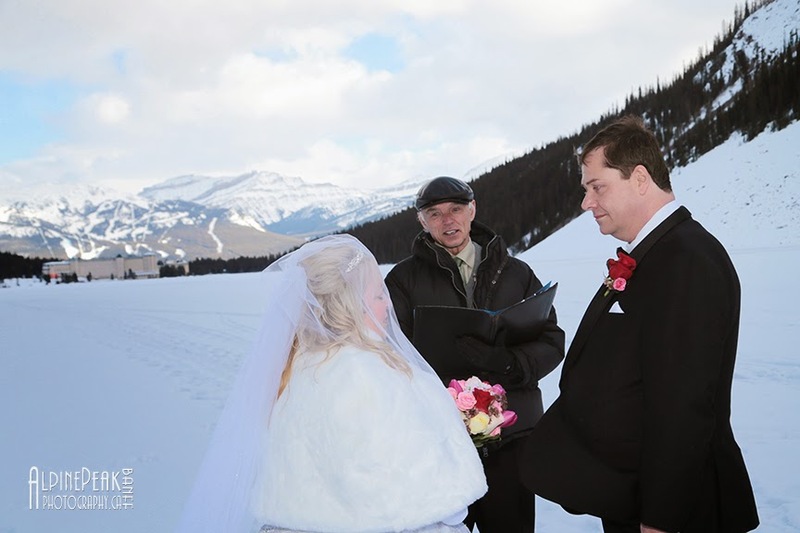 and Rob White our marriage commissioner was assisting us in ensuring it had a safe ride. 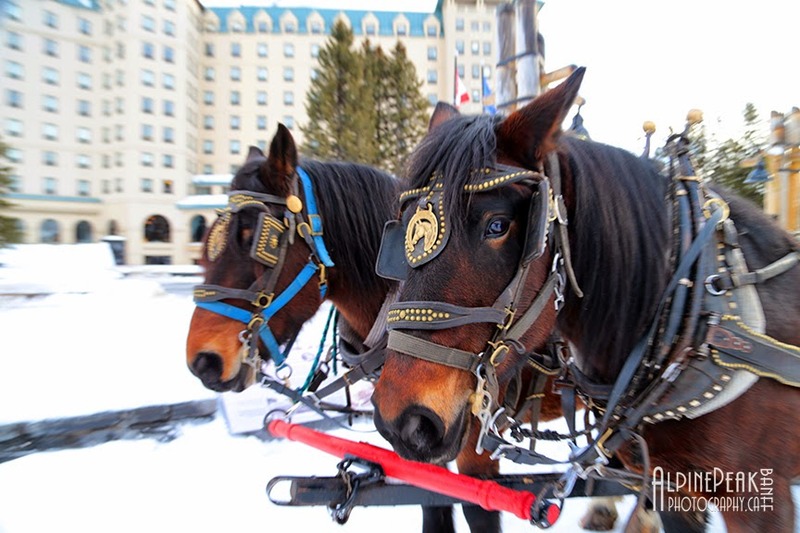 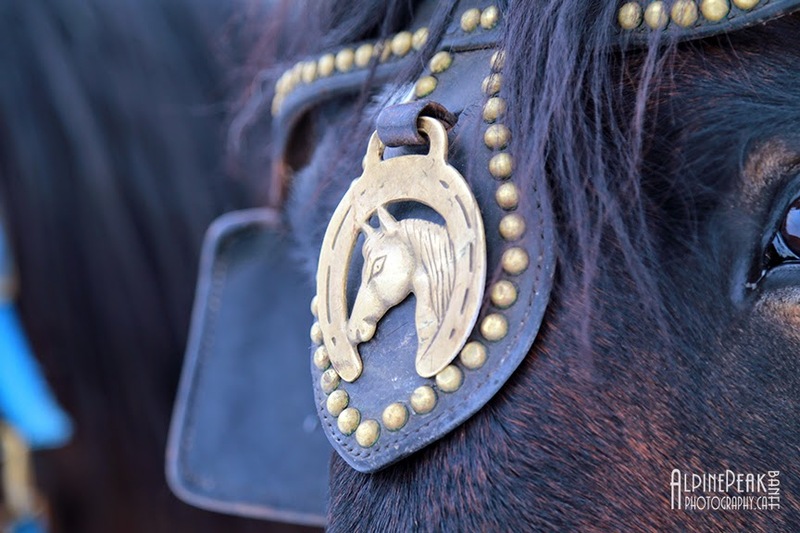 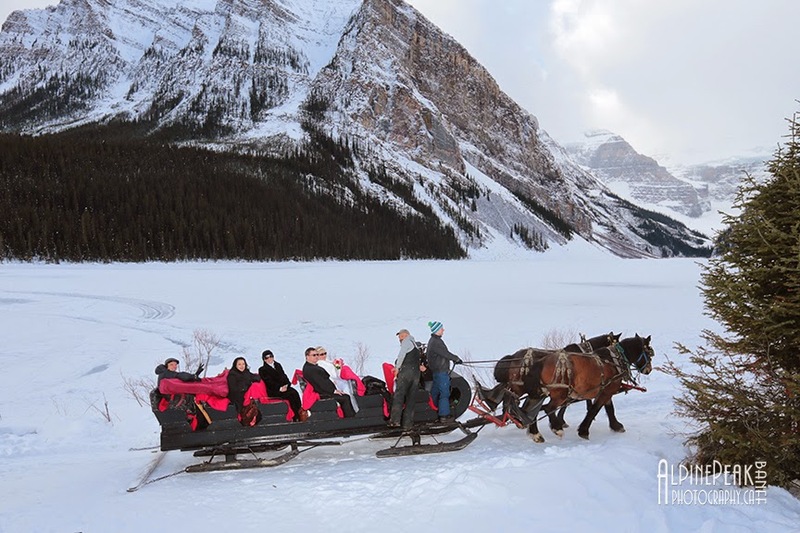 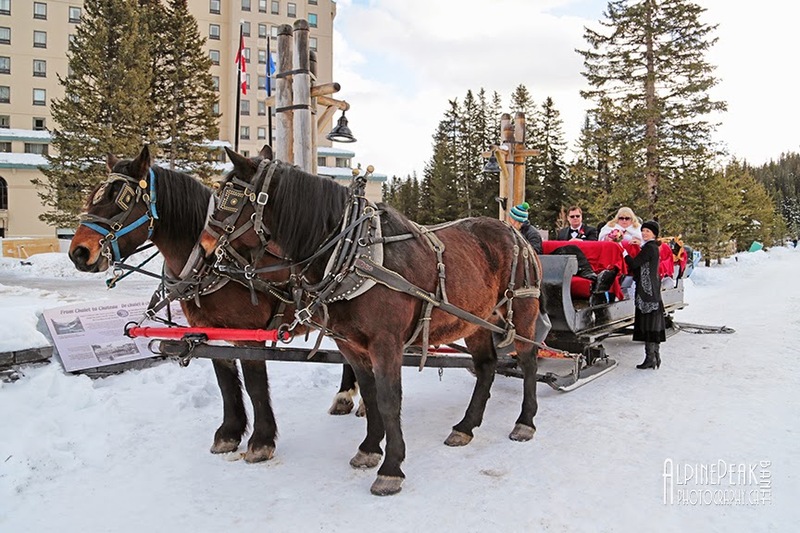 Brewster Adventures at Lake Louise offer hourly sleigh rides all winter long. 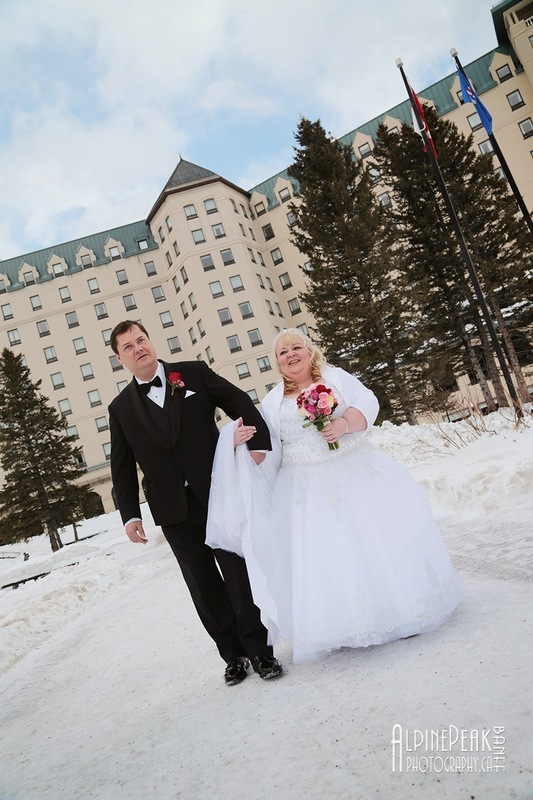 Off we go into the Winter Wonderland - so romantic! 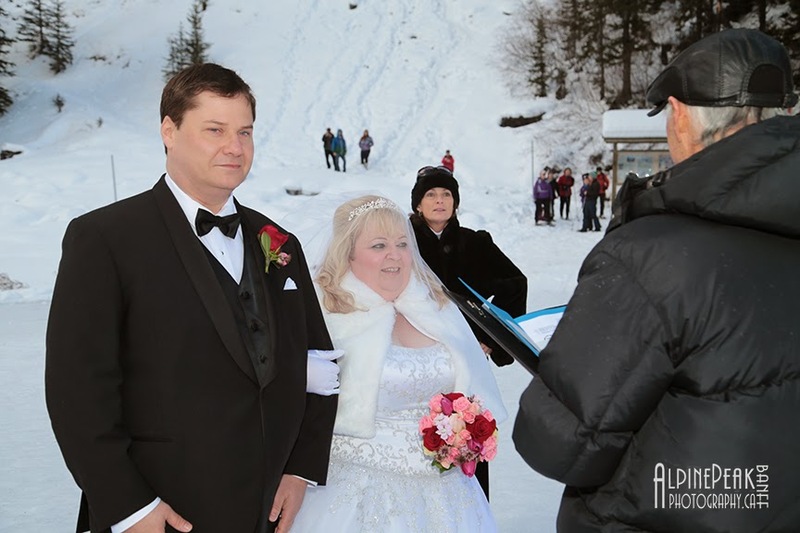 the moment leading up to their wedding ceremony. 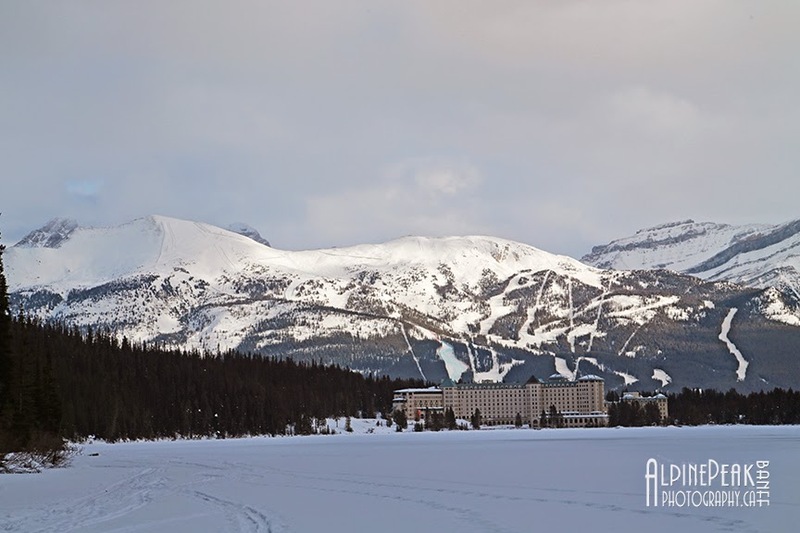 When we arrived at the back of Lake Louise we had an amazing view. 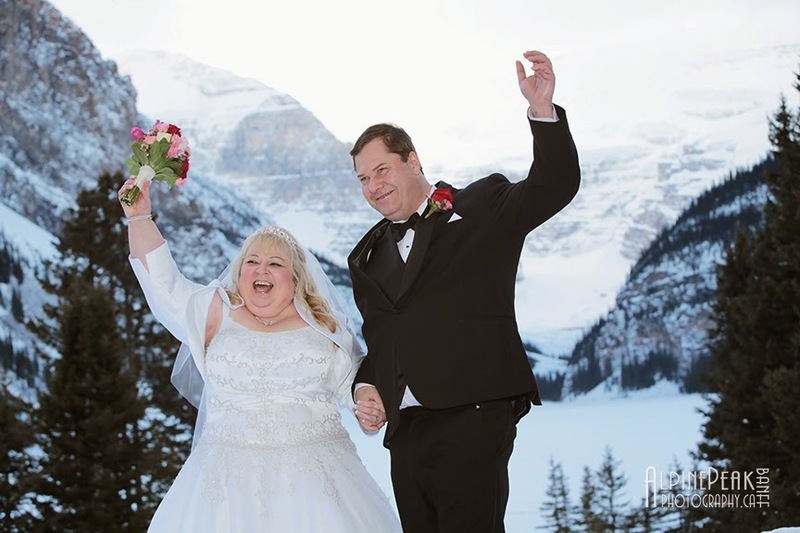 you can clearly see the Lake Louise Ski Area. 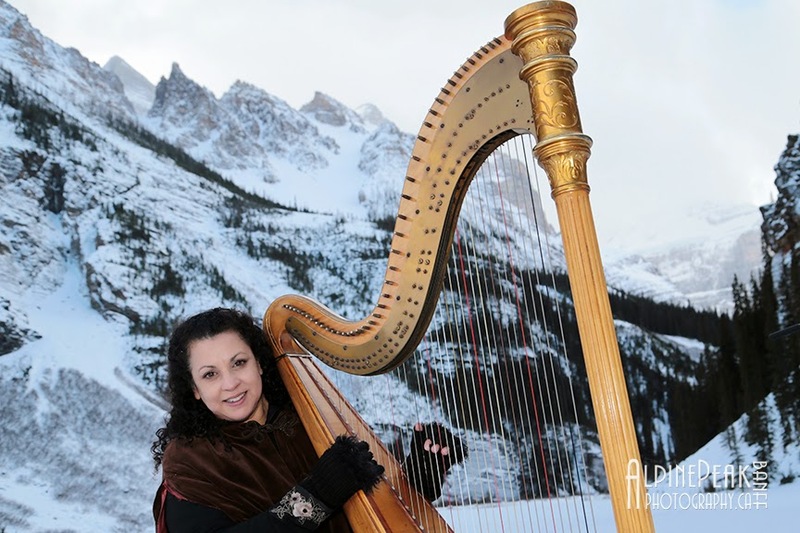 Deborah is a world Class Harpist and a good sport. 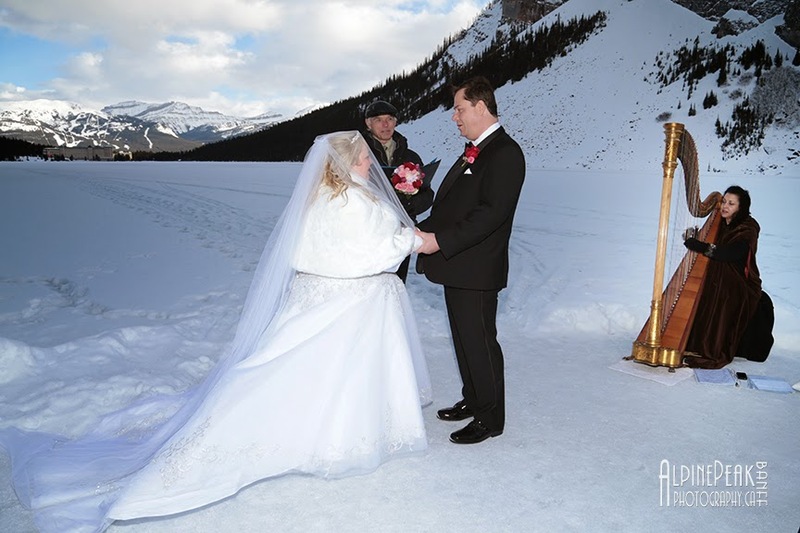 it was the first time it had been to the back of Lake Louise. 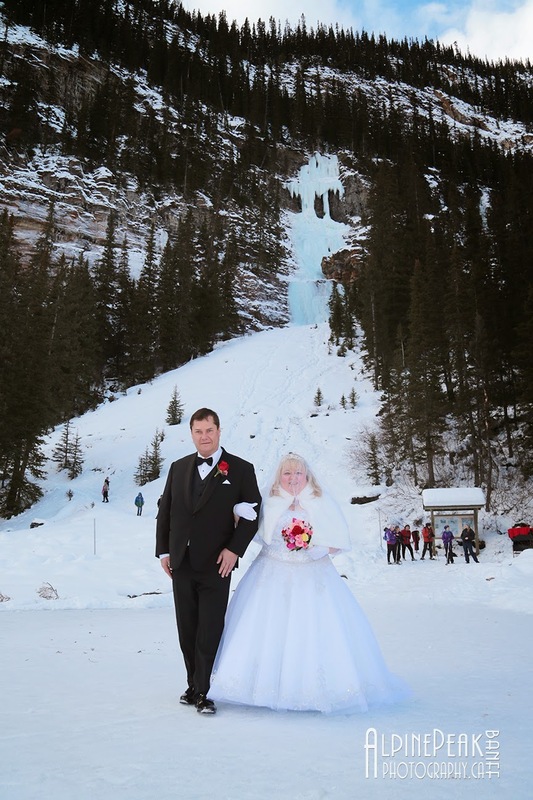 we had a lovely view of the frozen waterfall behind them. 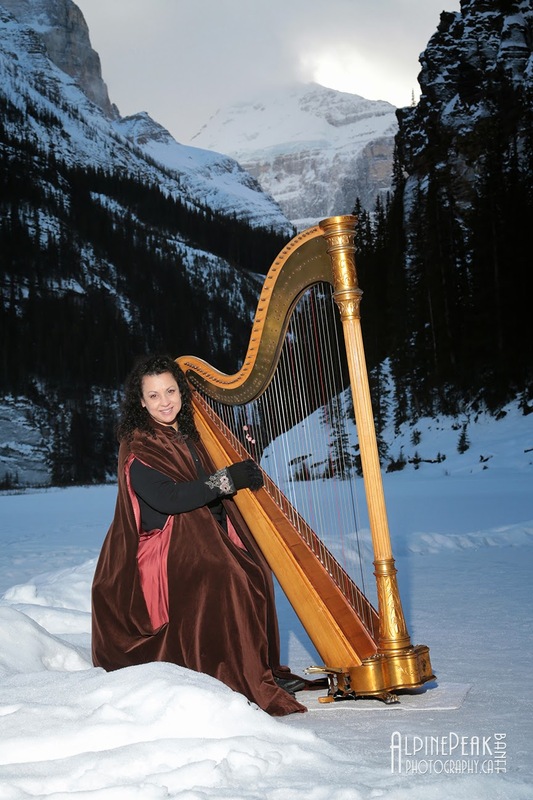 surrounded by the majestic mountains at Lake Louise. 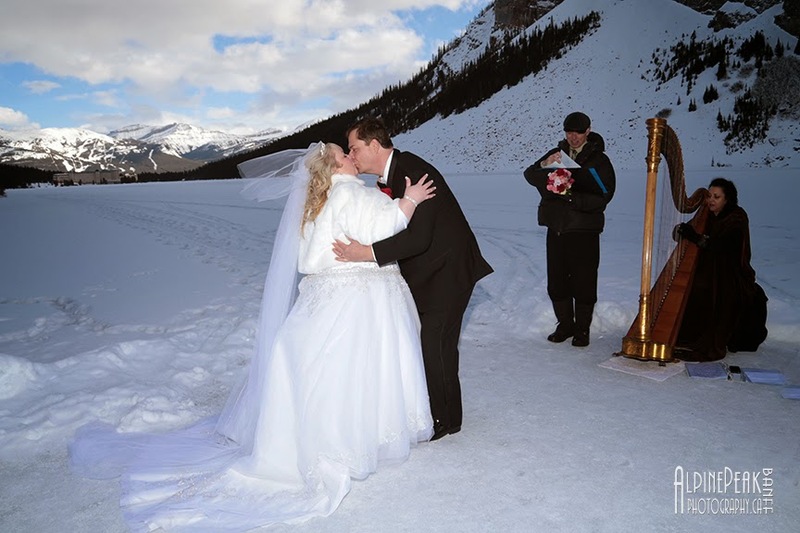 Deborah added a magical touch to the ceremony with her beautiful harp music. 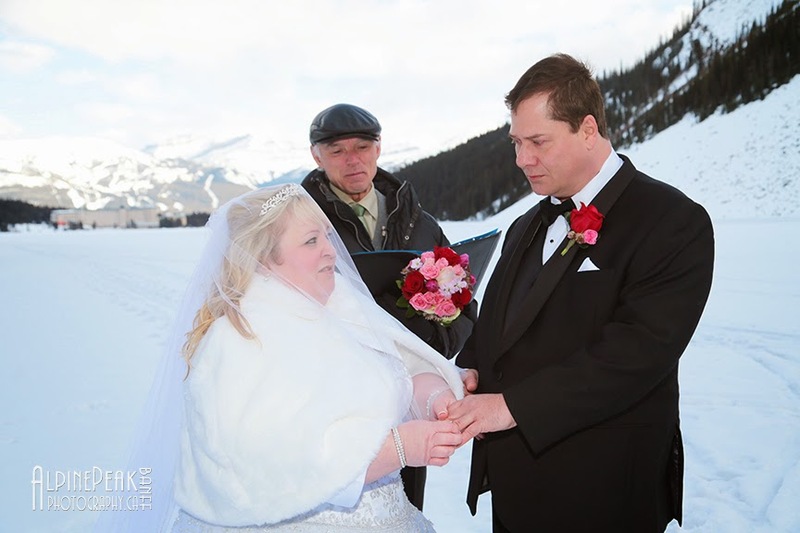 she had just married the man of her dreams! 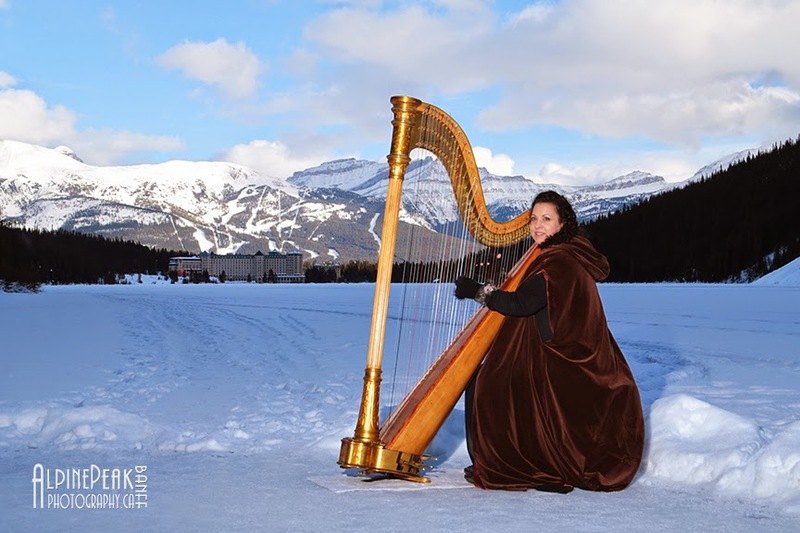 Harp Angel with her antique harp. 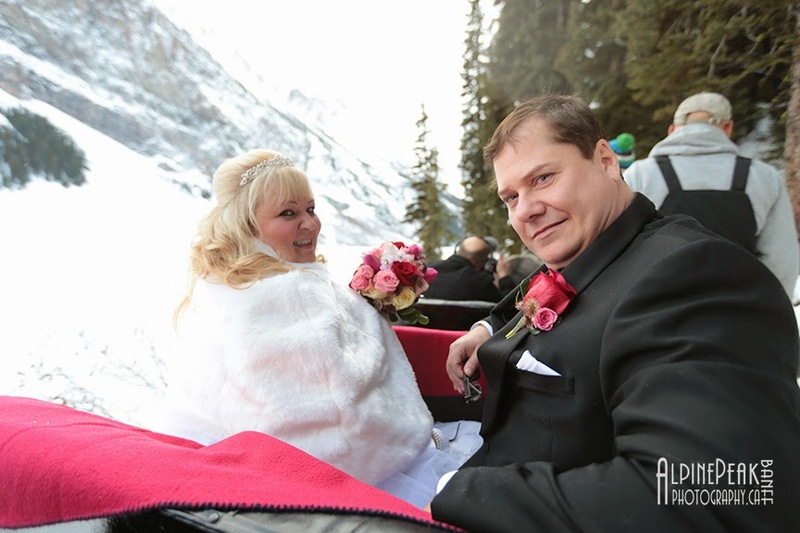 Our married couple gets ready for the ride back to the Chateau Lake Louise. 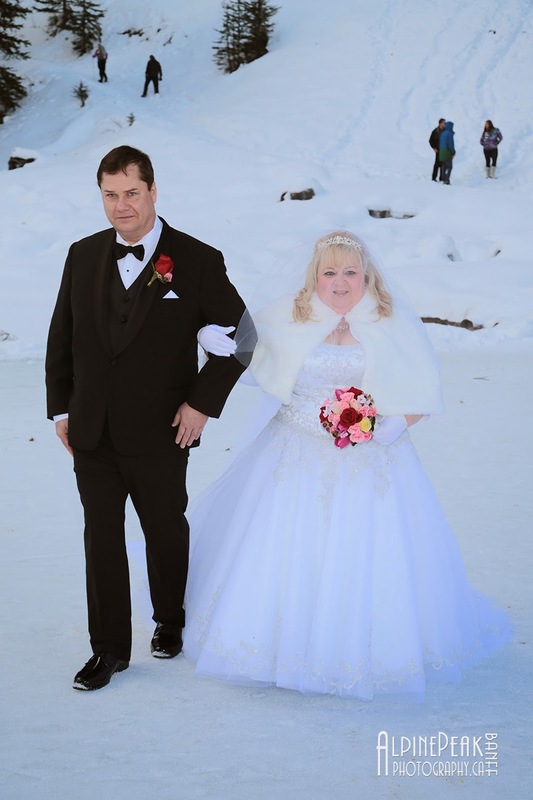 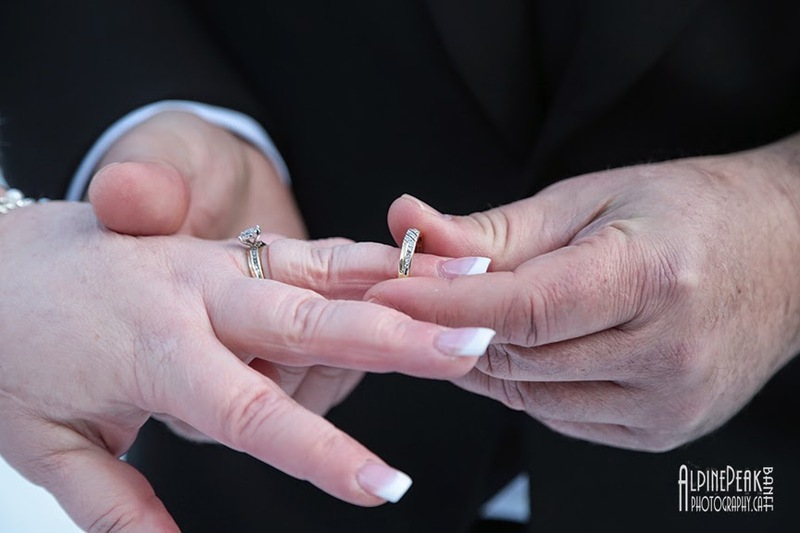 Wishing Christine and Barry a lifetime of love and happiness together. 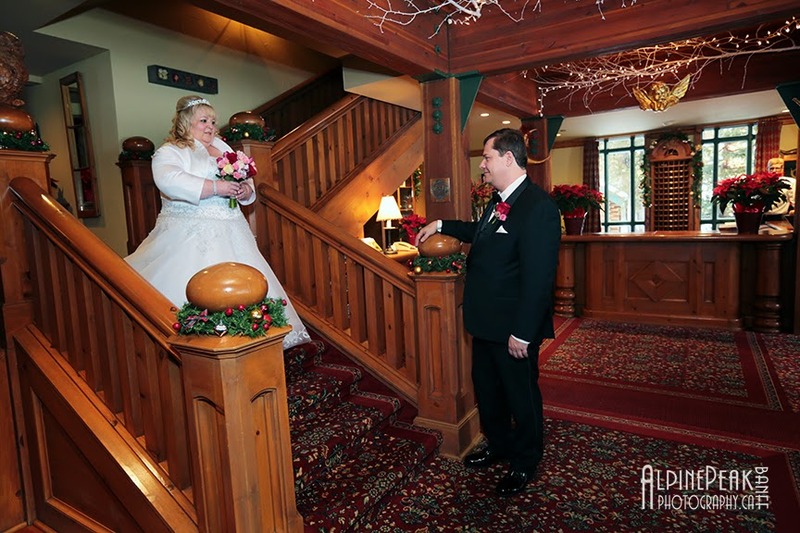 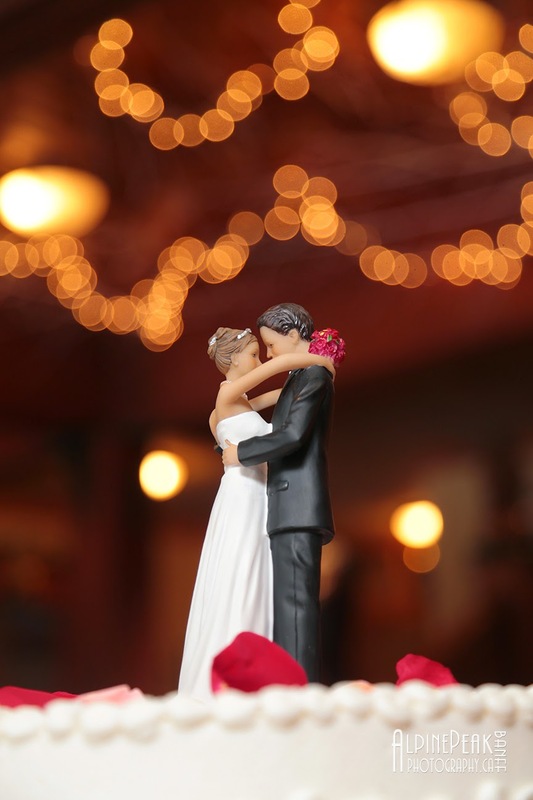 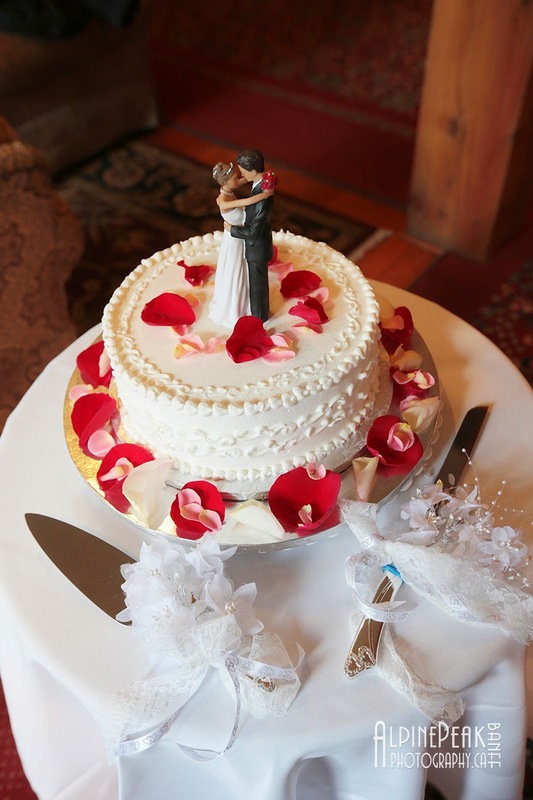 Thanks for letting us be part of your special day! 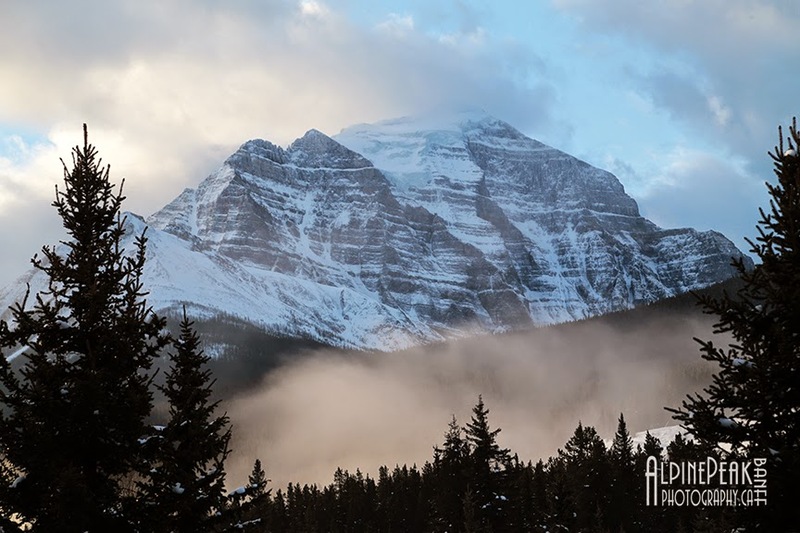 Photographs by: Malcolm Carmichael - Alpine Peak Photography, Banff, Alberta Canada.